Home » How-To Library » What's a Whole House Generator? We refer to standby generators capable of producing enough power for all of your home's circuits as "whole house" generators. If you're not able to provide power to all of your home's circuits, you don't really have a whole house generator. This means that no generator on the market can truly be labeled a whole house generator, but any generator has the potential to be a whole house generator, depending on the size of the home it's providing power to. Circuit management is a crucial factor in powering your whole house. If you aren't concerned about powering every room in your home, you can opt for a load center, which will transfer the generator's power to specific circuits that you want to send power to. If you truly want to power your whole home, and you have a generator large enough to do so, you'll have to go with a whole house switch (or a service disconnect switch). These will manage the distribution of the generator's power to all of the circuits in your home. Generally, these generator switches are designed to send power to just the critical circuits in your home. 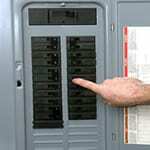 They only have 8-16 circuits, meaning you can only restore power to 8-16 circuits in your breaker box. If you have a larger home, you probably won't get all the lights back on. You pick the rooms that are most important. For example, the kitchen, the basement so your sump pump runs, and the garage so you can get your cars in and out. However, many older, smaller homes only have 10 circuits, in which case, a properly-sized generator and a transfer switch with 10 or more circuits would be a whole house generator. Whole house switches, also called "service disconnect switches" offer more versatility than load center switches. Instead of choosing circuits, you can power your entire electrical panel. The other main difference lies in the ability to manage high-demand appliances/circuits, such as central air conditioners. Although the generator may lack the strength to start two high wattage appliances simultaneously, with proper accessories, you will be able to manage the loads as power becomes available. There are lots of misconceptions regarding whole house generators. Depending on the size of your home and your circuit breaker, lots of different home standby generators could be considered whole house generators.